Four, five and six-digit displays. AMALGAMATED Instrument Co (AIC) has released four, five and six digit numeric LED displays housed in wall-mount IP65 enclosures. The four-digit display has digits 57mm-high digits with a visibility rating of 25m. The five-digit display has 45mm-high digits with a visibility rating of 20m. The six-digit display has 38mm-high digits with a visibility rating of 18m. The displays are manufactured using ultrabright LEDs and have an autobrightness function that automatically adjusts the display level to the ambient light conditions. This eliminates the display dazzle that can occur in low ambient light while allowing the display to be seen in daylight. The wall-mounted enclosures are manufactured from UV-resistant black ASA with an IP65 environmental rating. A kit to allow panel mounting of the displays is also available. 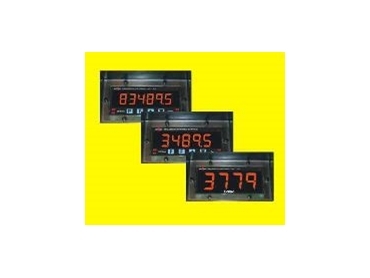 Applications that can use these displays include weighing, counting (rate, total and grand total), time and temperature displays. These can include high precision real time clocks or remote displays with serial input, RS232, RS485, serial current loop or synchronous serial interface (SSI). Calibration and setup are achieved using pushbuttons and no special tools are required. The four and six-digit displays have the pushbuttons on the faceplate and the four-digit display has the setup buttons on the main board. Displays with four or six flip digits are also available. The digits are 39mm high with a visibility rating of 18m. These displays are suitable for use in high ambient light levels. They are not available for all applications.